Eco tops come in Eco Rectangular or Eco Curve options. The Eco Curve boasts a gently sloping front edge that's easy on both your wrists and eyes. Eco Curve UV-cured, powder-coated desktops are made of 100% recycled wood composite and are available in black or white color choices. Our Eco top features a traditional rectangular desktop shape, while our Eco Curve option is designed with a gently sloping curved front edge. This curve allows you to reach more of your desktop and rest your wrists on the edge of your desk for more comfort. Take your work to new heights with the UPLIFT V2 Ergo-Edge Curve Standing Desk. With a revolutionary design that lets you reach more of the desktop, while still enjoying the benefits of an ergonomically defined workspace, this desk is a cut above in the sit-stand category, bringing you to a new realm of functionality, comfort, and safety in the office. On the same frame Wirecutter named the "Best Standing Desk," the desktop features a curved cutout meant to get you closer to your work area; its tapered edge has the perfect angle to maintain circulation and rest your wrists as you game, type, and mouse. We pair these tops with our powerful and reliable UPLIFT V2 Frame or UPLIFT V2 Commercial Frame, giving you a sleek-looking and surprisingly advanced desk that helps you do more. Whichever frame you choose, rest easy knowing you're getting the best standing desk on the planet. Click here to learn more about both frames—and to compare the differences between them. On top of our UPLIFT V2 Frame sits the ergo-edge curve—an ergonomically tuned desktop that really puts you in the middle of the action, letting you work in more comfort than you ever thought possible. Thanks to a curved cutout, you're placed right within your neutral reach zone—that comfy sweet spot that lets you work for longer. Its unique ergo-edge also allows you to rest your arms in more comfort than desktops with squared edges. Choose from eco or bamboo for your desk; at 0.75" thick, this desktop is more than ready to stand up to the rigors of daily use. UV-cured, powder-coated, and environmentally friendly, work knowing your desk is long-lasting, good for you, and good for the Earth. We never use harsh agents or chemicals in the creation or finishing of our desktops, which protects not only your desk but your indoor air quality, as well. If you're interested in a sit-stand desk and want to shop all of our desktop options, shop our UPLIFT V2 Standing Desk (V2 or V2 Commercial). Looking for just desktops? Check out our comprehensive Desktop Brochure. The UPLIFT V2 Frame features a height range of 24.5" - 50.1" (without a desktop). This popular frame is remarkably sturdy and quiet, with advanced features rarely seen in office furnishings. And it supports the desk that was selected as the Best Standing Desk by Wirecutter! The UPLIFT V2 Commercial Frame features a height range of 21.6" - 47.7" (without a desktop). This frame has a lower starting height, a lower max height, and a larger overall height-adjustment range, compared to the UPLIFT V2 Frame. In addition to meeting ANSI/BIFMA durability standards, it also meets the ANSI/BIFMA G1-2013 height standard, which is required by many of the largest companies in the world. Our UPLIFT V2 Frame comes with four dozen independent mounting points, which allow you to use your desk in a host of new ways. Install a wide range of accessories, including desk extensions, CPU holders, and power strips, right onto your desk frame. We even have an under-desk hammock, to hang underneath when you feel like indulging in an afternoon power nap. These holes are built discreetly into the frame, so you can show off what's important while hiding what's not. Please note: the hammock is only compatible with the UPLIFT V2 Frame. It's not compatible with the UPLIFT V2 Commercial Frame because it interferes with the lower crossbar. With the advanced keypad, save time when changing desk heights—and enjoy even more features. Four memory buttons let you program your ideal heights quickly and easily. Transition between sitting and standing positions just by selecting your preferred preset. When you feel like standing, it gives you enough time to rise and move your chair out of the way. Anti-collision sensitivity and a keypad child lock are two safety features we added. Work knowing your desk will only adjust when you want it to—and if it does bump into objects or people, it will be smart enough to know to stop. Set the desk's upper and lower height limits to prevent your desktop (or monitors) from knocking into shelves above—or any furniture below. Lastly, an auto-dark LED display helps you keep focus on the task at hand; the keypad screen will dim to distraction-free darkness 10 seconds after you press a button. We're proud to be named the "Best Standing Desk" by Wirecutter and Forbes, in addition to being rated #1 by Wired, Lifehacker, and many others. Hundreds of thousands of happy customers have chosen—and loved—UPLIFT Desk, including hundreds of Fortune 500 companies. We'd like to take a moment to say thank you—from the bottom of our hearts, we truly appreciate the support you've given us over the years. We created UPLIFT Desk after listening to you, and it's been our goal to help every person and office build spaces that help them achieve more and feel better. We remain dedicated to keeping our prices as low as possible, while holding our quality to the highest standards. People all over the world are working better every day, and that is due in part to the support you've given us over the years. Thank you for letting us take this journey with you. Give your desk and your devices plenty of juice with power solutions from UPLIFT Desk. We have accessories for every need, from power grommets to surge protectors to clamp-on power units—all designed to help you stay plugged-in and perfectly charged throughout the day. Every workstation has different needs for wire management. If your desk has dangling cords and cables you'd rather have tucked away, outfitting your desk with the right wire management tools can make all the difference. Not only will these accessories protect your cords from pulling out of wall outlets or snagging as you adjust the height of your desk—they'll also help you maintain a clean and polished look at your workstation. To get you started in your organizing efforts, your UPLIFT V2 Ergo-Edge Curve Standing Desk comes with a wire management tray. Putting together an office of four or more desks? Let us assist you in designing the ideal office; we offer complimentary space planning that can be customized to your exact needs. Just complete four simple steps, and we'll start working on configuring your office space—absolutely free, no strings attached. With your layout, you'll also receive a discounted quote for your order, making your new space even more affordable to achieve. Is the Ergo-Edge Curve desktop available in any other thicknesses? The Ergo-Edge Curve desktop on this listing is only available in a 0.75" thickness. Does the desktop come pre-drilled for easy assembly? Yes! Your desktop will come with pre-drilled guide holes for the frame and the keypad. The UPLIFT V2 Ergo-Edge Curve Standing Desk is highly customizable, we do not pre-drill guide holes for accessories so that you can place them in any configuration you choose. Do you offer any other color choices for the Ergo-Edge Curve desktop? On this listing, the Ergo-Edge Curve desktop is available in a dark bamboo finish and a lighter bamboo finish. Can I special order an Ergo-Edge Curve desktop in a custom size? Our Eco desktops only come in the shapes and sizes sold here. Can I get a sample of the Ergo-Edge Curve top? Samples of our bamboo desktops are not available at this time. If you live closeby, you are always welcome to stop in to see our showroom. Does the Ergo-Edge Curve desktop have rounded corners or sharp corners? The corners on the Ergo-Edge Curve desktop are slightly rounded compared to the straight edges found on our laminate tops. What is the weight capacity of this desk? Our 2-leg desks will hold a whopping 355 pounds. That is a lot of monitors! Just remember to evenly disperse the weight along the desktop. Can I add my own desktop? Yes! If you have your own desktop, check out just the UPLIFT V2 Frame without a desktop. You should be able to assemble the desk frame and attach it to the desktop by yourself. However, you will need two people to safely turn the desk right-side up after assembly. 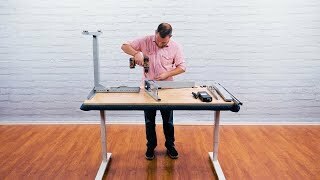 Check out our assembly video to see just how easy it is to put your desk together. Can I use the accessories I already own with this desk? If you already own a keyboard tray, monitor arm, or CPU holder, you can certainly add your accessories to your new desk. Just double-check the manufacturer's instructions to make sure that your accessory is compatible with the thickness of the desktop. Keep in mind that the crossbar on the UPLIFT desk will run across the center of the desk and may get in the way of a keyboard tray or CPU holder. Our track spacer solves this problem by allowing your keyboard tray or CPU holder to retract underneath the desk without interfering with the crossbar.